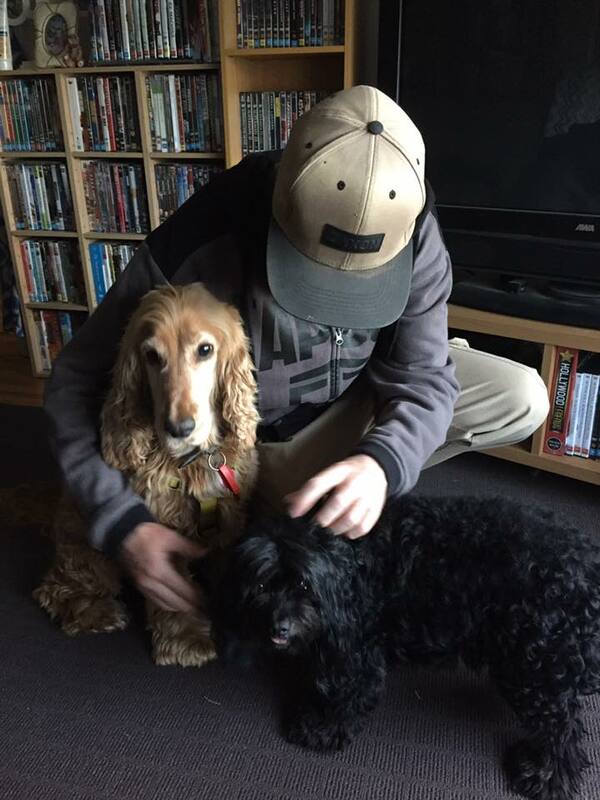 Our English Cocker Spaniel, Bailey, passed away recently. He had an aggressive, inoperable tumor in his abdomen that sent him into a relatively rapid decline within the course of a few weeks. Unfortunately we had to make that dreaded decision of pain over quality of life for a much loved family member. Bailey was struggling with going to the bathroom and holding food down. He was no longer able to go for walks and his enthusiasm for barking at next door's cat in our front yard was getting less and less. Despite all this he still had moments where he seemed perfectly fine, even wagging his tail. Our vet seemed to think he didn't have long with such an aggressive tumor, particularly if it ruptured, which would cause Bailey to bleed to death. Not a nice way to go, and something I experienced first hand with our cat, Casper. 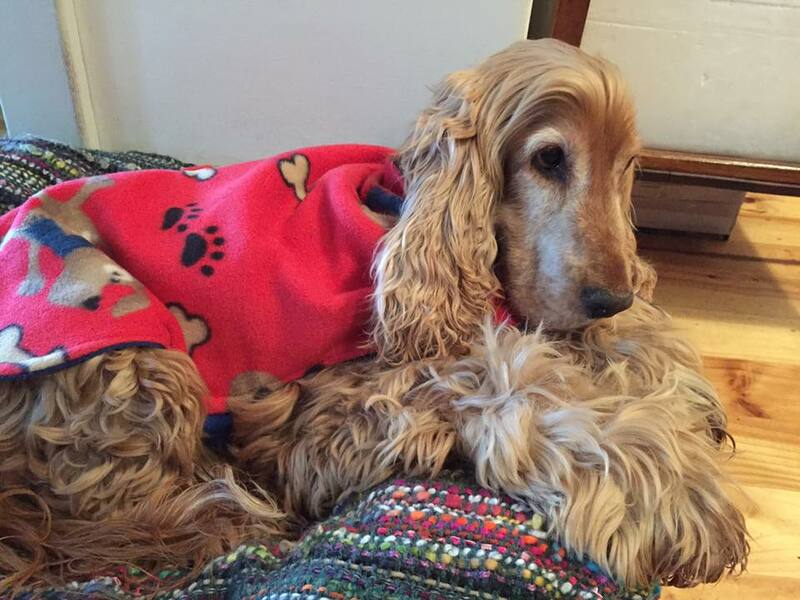 We had a lot of support from friends who came along when Bailey received his diagnosis. Whilst we were all hopeful it was going to be a better outcome, it wasn't a complete surprise either. We just thought Bailey would have more time. Out vet estimated a couple of days. Bailey was an impressive dog. I know this because he'd get noticed all the time out on walks. People would comment on his golden coat as well as his general size. He was unusually large for a Cocker Spaniel, with massive front paws that always made it seem like he had more growing to do. Unlike many Cocker Spaniels he still had his full tail. Cocker Spaniels his age typically have had their tail docked (though I believe this practice is illegal now), and I can easily see why one might for damage control. Bailey was not very spatially aware of his placement within his surroundings. Our little black dog, Oscar, learned to anticipate Bailey's tail after being hit in face from it wagging so many times. It wasn't just his tail that could be an issue as it took Bailey quite a while to remember not to just turn himself around quickly, indoors, without any thought as to what was around him. He banged the side of his head, hard, into so many walls and pieces of furniture it was astounding that he never knocked himself out cold. Although Bailey had the nicest temperament he was often misunderstood on first impressions. He came to us as a rescue dog at the age of about 6 years old. Whilst we didn't know his early life (after leaving his parents - who we did know), his last owner was so frustrated with him that he wanted him gone ASAP, under the threat of having him put down. 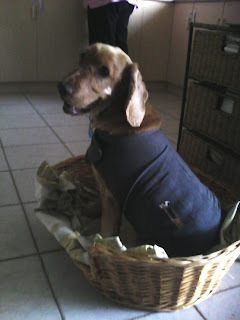 That owner, as I understand it, used to keep Bailey in the backyard with a muzzle on to try and stop him from barking. Which he would do excessively if a thunderstorm went overhead. Whatever happened in his past, it left him with one unfortunate quirk that gave the impression he didn't like people. Whenever anyone wanted to come over and meet Bailey for the first time, I had to warn them, do not put your hand out for him to smell (as many people are taught when approaching a new dog for the first time). For some reason Bailey would see this as a threatening gesture and was guaranteed to lunge straight at the person's hand, intending to bite, but never hard enough to break skin. It was more of a warning than anything else, and it tended to make him seem vicious and unfriendly with strangers. However, even with people he'd snapped at, if you just let him do his own thing, without trying to pat him, he'd be completely fine in less than a few minutes. He might even come up to get a pat or some general attention like nothing had ever happened. It was just the initial meeting you needed to get right. So many people still put their hand out, even when told not to. Bailey would seem fine, then suddenly lunge. To help we got him a bright yellow harness and lead with 'Nervous' written on it in large, clear lettering. Nervous wasn't really accurate but it at least made people stop and think before reaching out to him. Bailey's other issue was other dogs, when out on walks. If, at any time, another dog came too close (within 2-3 metres) Bailey would bark uncontrollably at them and even attack if they got close enough. Even though we had a dog trainer come in to help us try and solve this behavior I never could get him to stop every time successfully. Meeting other dogs on a leash was always a battle, where sometimes I could get Bailey to sit quietly, but mostly I couldn't, without me getting really aggressive and looking like a dog abuser. Coming across other dogs that weren't on leads was a complete nightmare that I'd avoid at all costs (keeping in mind that I always walked Bailey and Oscar together and Oscar had a tendency to mirror Bailey's behavior). Another dog coming in too close, too quick, would result in an immediate fight situation between Bailey and the incoming dog. The number of times I've had to reach in and grab a completely unfamiliar dog by the collar and hold it apart from Bailey whilst trying to stop Bailey from attacking is more numerous than it should be. Other dog owners have often misunderstood my move, thinking I'm trying to stop their dog from hurting mine. Unfortunately it was the other way around. Bailey had already had a pretty ordinary life before meeting us. The last thing I wanted for him was to be labelled a vicious dog and potentially be put down due to the stupidity of other dog owners not controlling their dogs. This inability of Bailey to be nice with other dogs in my presence (I've been told he was fine with other dogs when we've booked him for a stay at a kennel) along with his warning bites ultimately ended up isolating us from other people walking their dogs. After about two years in I just got tired of trying to fix his behavior. Instead we'd go for walks when the park was likely to be empty. I also had several different routes around various walking trails and paths in our town for both variation and reducing the chance of bumping into other people with dogs. Despite all of this, Bailey never attacked Oscar aggressively when they first met. It may have been because Bailey was in unfamiliar territory, or it may have been because Oscar is a very social dog. 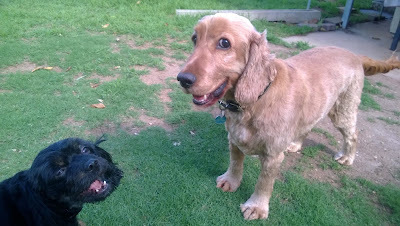 He loves meeting other dogs, especially if they want to play - or at least he did at the time we met Bailey. Right from the get go Oscar would try to play with Bailey and Bailey seemed to respond. Their epic games of chasey and play fights often ending up with Oscar being 'air humped' by Bailey in some weird act of dominance. and Bailey's epic play fights. Oscar was always persistent. No matter how often Bailey managed to get Oscar to roll over and conceded defeat, Oscar would get right back up again and continue the fight. I have an epic series of videos of the same fight where Bailey, completely worn out, rolls over in an attempt to concede and Oscar still keeps going - despite being puffed himself. The two of them would play less and less, largely due to Bailey's age, I think. It became harder for Oscar to get him to play with him. However Bailey was always up for a game of tug-of-war, using one of his toys, with me right up until a month or so before he passed. As well Oscar and Bailey would remain united over the problem of next door's cat in our yard - even in his last weeks. Bailey is the first pet where I've been part of the decision of whether to euthanize before their quality of life becomes horrendous. Both myself and my partner were kind of hoping he'd drift away in is sleep before the day we arranged with the vet to have him put down in our home. Unfortunately drifting away was not really on the cards for Bailey. The most likely outcome seemed to be his tumor bursting. Then it would be a rush to the vet for a similar end to our cat, Casper. We didn't want that for Bailey. Instead my partner held him as the vet gave him some drugs to relax and send him to sleep before being injected with a final dose that would end his time. The whole process was tough, sad and very heartbreaking. I watched close by, holding Oscar. I noticed, after Bailey was injected with the first round of drugs that he seemed to relax into the most peaceful sleep I'd seen him have in ages. (Bailey was something of a fitful sleeper, often twitching and waking up howling). Whilst I was fully prepared to try and save Bailey, with operations etc. the vet didn't give us that option. Instead, we gave him, what we hope he would have wanted, and what we wanted for him, a peaceful end, drifting off in his sleep... or at least as close as we could get to making that happen. Bailey will always be remembered in our home. He was my partner's 'dream dog' - she'd always wanted a Cocker Spaniel. There was a time when I was younger that a Cocker Spaniel was my dream dog too (that's why one of my very first cartoon characters was a Cocker Spaniel called 'Chips'). For me, Bailey was pretty much my shadow, unless my partner was home. Then he'd shadow her. He was the kind of dog that needed to be in someone's company. If Oscar was getting too much attention... or any attention at all... he'd come over and make sure you knew he was there for your attention too. I personally think this image (right) my partner took, captures Bailey pretty well. He clearly is the center of attention, with Oscar and I in his shadow. People just noticed him wherever he went but I think he was pretty glad to have us as family for the last four and a half years. Open or closed hand didn't matter with Bailey... he'd give you just enough time to think things were okay, then he'd lunge with a warning bite. Given time and training any good trainer could've helped us to fix Bailey's behavior around other dogs. Neither of us really had the time or the money for regular, ongoing behavior training. RIP Bailey. Sorry for your loss David.